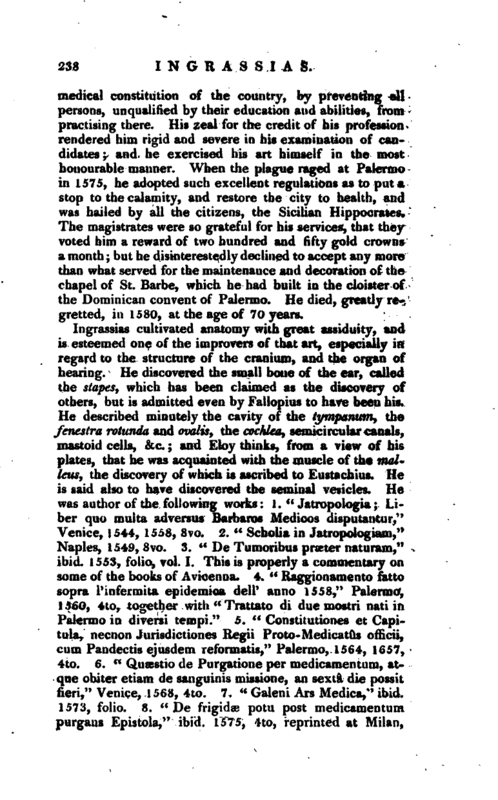 , an eminent physician and medical writer, a native of Sicily, was born in 1510. He studied medicine at Padua, where he took the degree of doctor in medicine in the year 1537, with singular reputation; insomuch that he soon received several invitations to professorships from different schools in Italy. He accepted the chair of medicine and anatomy at Naples, which he occupied for a number of years, lecturing to the most crowded audiences drawn by his fame from all parts of the country. He possessed peculiar qualifications for the office, having united a consummate knowledge of the writings of the ancient physicians with great practical skill and a sound judgment, which led him to- estimate justly the merits and defects of those fathers of the art. 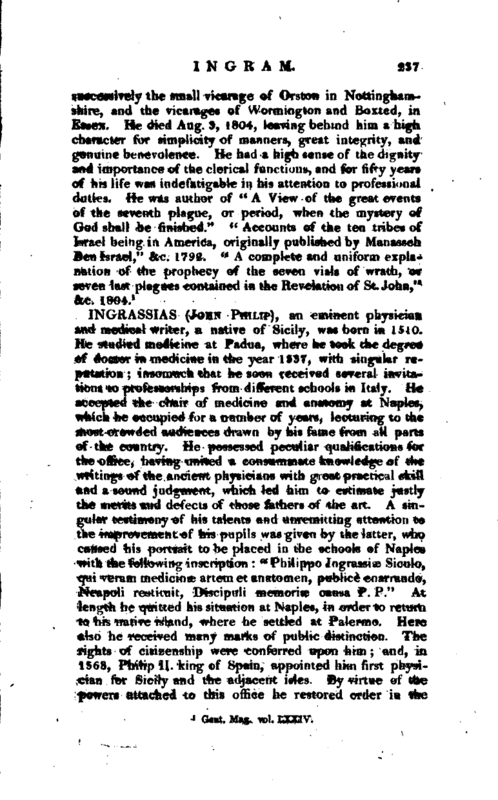 A singular testimony of his talents and unremitting attention to the improvement of his pupils was given by thektter, who caused his portrait to be placed in the schools of Naples with the following inscription: “Philippo Jngrassias Siculo, qui veram medicinae artem et anatomen, publiee etiarrando, Neapoli restituit, Discipuli memorise causa P. P.” At length he quitted his situation at Naples, in order to return to his native island, where he settled at Palermo. Here also he received many marks of public distinction. The rights of citizenship were conferred upon him; and, in 1563, Philip II. king of Spain, appointed him first physician for Sicily and the adjacent isles. By virtue of the powers attached to this office he restored order in, the | medical constitution of the country, by preventing all persons, unqualified by their education and abilities, from practising there. 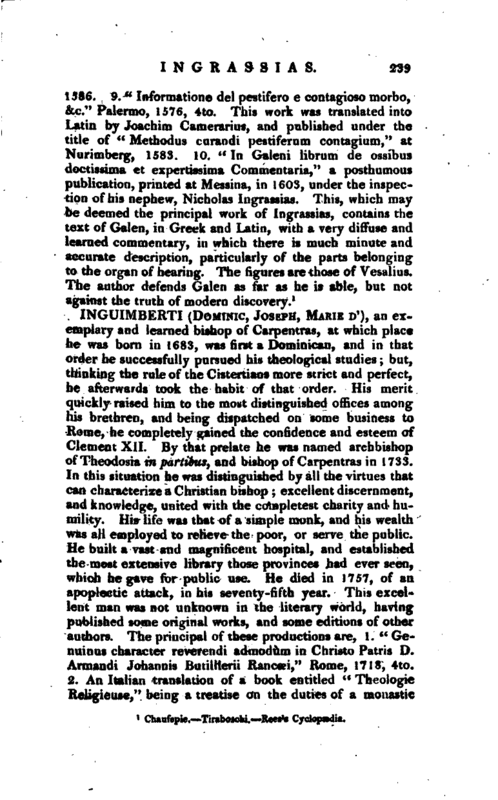 His zeal for the credit of his profession rendered him rigid and severe in his examination of candidates; and he exercised his art himself in the most honourable manner. When the plague raged at Palermo in 1575, he adopted such excellent regulations as to put a stop to the calamity, and restore the city to health, and was hailed by all the citizens, the Sicilian Hippocrates. The magistrates were so grateful for his services, that they voted him a reward of two hundred and fifty gold crowns a month; but he disinterestedly declined to accept any more than what served for the maintenance and decoration of the chapel of St. Barbe, which he had built in the cloister of the Dominican convent of Palermo. He died, greatly regretted, in 1580, at the age of 70 years.